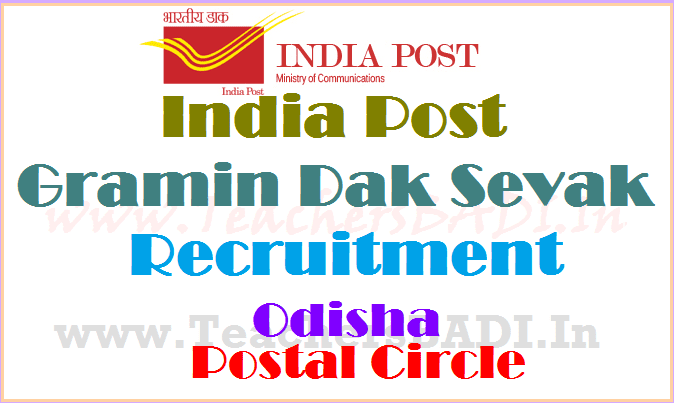 Govt Of India, Department of Post, Odisha Postal Circle has published the Gramin Dak Sevaks(GDS) Recruitment 2017 notification/ India Post TS GDS MC, GDS BPM, GDS Packer Posts Recruitment 2017 and Applications are invited by the respective appointing authority as given in the annexure ‘B’ against each post, from eligible candidates for the selection and engagement to the posts of Gramin Dak Sevaks under Odisha Postal Circle as listed in the Annexure. Odisha Postal Circle - 93 Gramin Dak Sevak Posts Recruitment 2017 notification and Last date is 20.12.2017: Odisha Postal Circle invites applications for the recruitment of the following Gramin Dak Sevak vacancies. Age: Between 18 to 40 years as on 21.11.2017. Last date for online application: 20.12.2017. Application online Submission End Date: 20.12.2017.